A comedy with brilliant visuals but limited depth, The Hudsucker Proxy has all the appeal of a Looney Tunes cartoon. Vivid, kinetic, and funny at a juvenile level, it is also almost instantly dismissable. It's the late 1950s, and Hudsucker Industries is a massively profitable company based in New York City. Regardless, founder and President Waring Hudsucker (Charles Durning) has inexplicably had enough, and throws himself out of the window, plummeting spectacularly to his death. 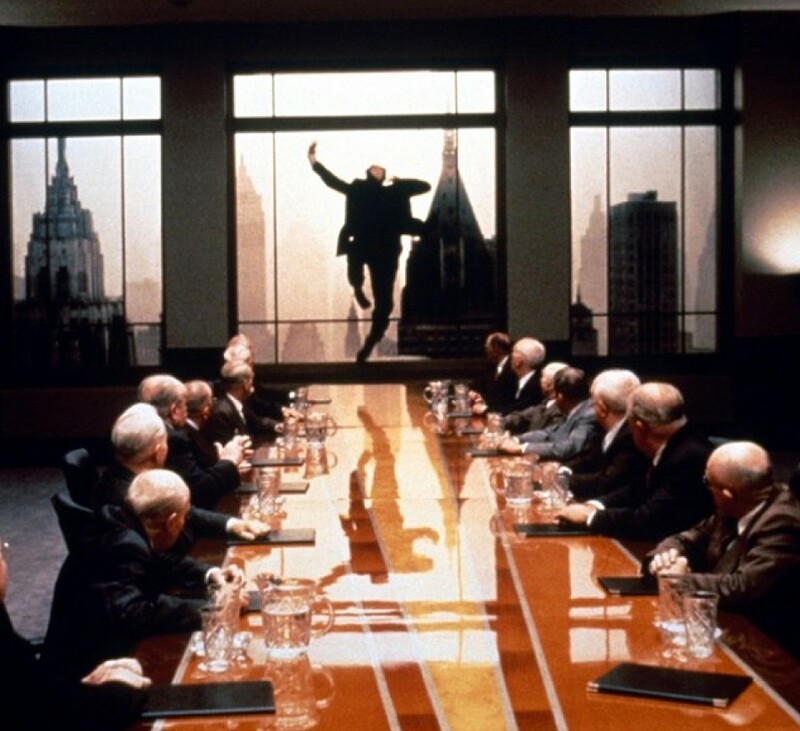 This causes a stock allocation crisis, and the most senior shareholder Sidney Mussburger (Paul Newman) hatches a plan: by installing a hopelessly inept new President, the stock price will crash and allow the Board members to scoop it up for cheap. The newest, apparently most dim recruit in the building is Norville Barnes (Tim Robbins), seemingly destined to a career in the basement mail room. Mussburger plucks him from obscurity and appoints him President, causing a stir in the business world and great excitement in the press about the identity of the unknown new leader of a gigantic corporation. Pulitzer Prize winning reporter Amy Archer (Jennifer Jason Leigh) takes it upon herself to uncover the truth, and under false pretenses gets close to Norville and starts to learn his real identity. Meanwhile, Norville is not as slow as he appears, and he has an invention up his sleeve that will throw Mussburger's plan for a loop. One of the more curious and experimental efforts from the Coen Brothers, The Hudsucker Proxy was a commercial disaster. The movie is all sizzle and no substance, the stylistic elements demanding all the attention and the characters reduced to overblown, ridiculous and childish representations. The sets are outstanding, the special effects wondrous, the cinematography imaginative, and the colours jump off the screen, and there are a couple of point-of-view rapid free-fall shots from the top of the Hudsucker building that demonstrate cinematic wizardry. Unfortunately, behind the razzle dazzle is a vast emptiness where the humour is condescendingly ludicrous and adults demonstrate the maturity of toddlers. Surviving the silliness is Jennifer Jason Leigh. In a performance of confident rapid fire fast talking echoing the women featured in the screwball comedies of the 1940s, Leigh owns every scene that she is in, and makes Amy Archer the one memorable character in the movie. 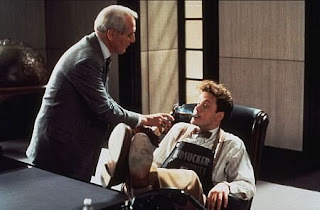 Tim Robbins stumbles around having things mostly happen around him, and Paul Newman attempts to emphasize sleazy villainy but never appears to be taking anything about the role too seriously. Joel Coen directs with a briskness that suits the high energy cartoon ethic. The Hudsucker Proxy may have a meaningless story to tell, but it does deliver it with a gratifying efficiency. Joel co-wrote the disappointing screenplay with his brother Ethan and Sam Raimi. The Hudsucker Proxy is a stunningly beautiful frame surrounding a disappointingly bland canvass.